October 6 university has crashed the expectations by applying new teaching methods in El-Azhar University’s conference. 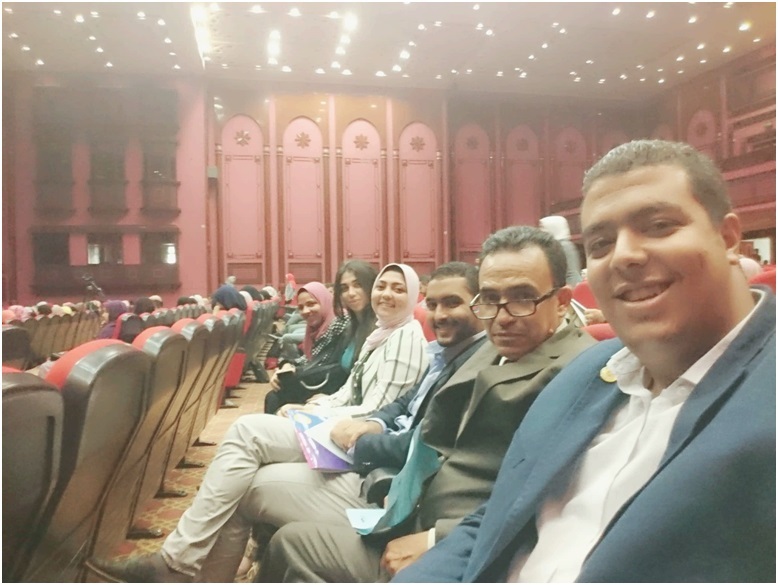 Dr. Nourhan Hassan and Dr. Dina Ibrahim, headed to the International Conference Center at Al-Azhar University to attend the "Forum of University Education and Pharmaceutical Manufacturing" conference. After the approval of the university to participate in the conference with (2) of the scientific posters of the 4th year pharmacy students practical project, insisting on the development of education, discovering new techniques in education, building the characters of students and keeping up with the new in the world of pharmacists. First The students and their supervisors took a tour in the conference between the workshops and the pharmaceutical companies and in different sections of the conference and its participants. 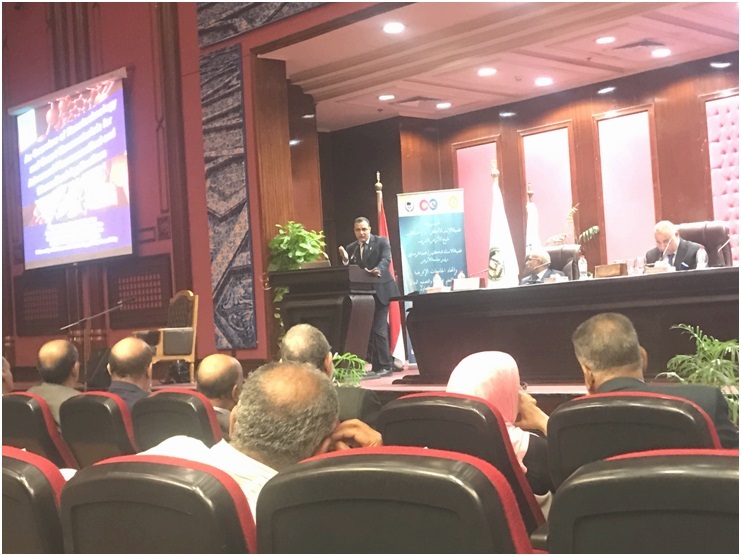 "Clinical Pharmacy Today and in the Future"
•	Prof. Dr. Abdel Nasser (Vice-President of Ain Shams University for Graduate Studies and Research). •	Prof. Dr. Maysa Shawqi (Professor of Public Health, Faculty of Medicine, Cairo University and former Deputy Minister of Health and Population). •	Mohi Obeid (captain of pharmacists). One of the most important points of discussion in the first session is to change the pattern of pharmacy study and linking all what is taught in the college in various departments and work on preparing the student for the labor market, to avoid the clash of students after graduation. Which added to the group participation moments of victory to achieve the forefront in this goal and increased enthusiasm to announce what they learned and prove the validity of new ways in the education adopted by the Faculty of Pharmacy University of October 6 under the supervision of Dr. Samir Osman. At 12 o'clock each of the students and faculty members went to discuss their researches within them a lot of determination to prove themselves and achieve success and the dissemination of the idea of their scientific project. The students explained the two posters with Arabic and English languages and discussed them in all the steps of their project. The judges and attendees welcomed the contents of the posters and the presentation of the students to their projects, which gave them more confidence in the way of education, their project and themselves. At 12:30 the group went to the conference hall to attend the second session. "Pharmaceutical Innovations: Challenges and Opportunities"
•	Dr. Osama Abdel Sattar (Professor of Analytical Chemistry, Faculty of Pharmacy, Al-Azhar University and former President of Memphis Pharmaceutical Industries). •	Dr. Lotfi Diab (Dean of the Faculty of Pharmacy in Benin, Cairo - University of Azhar). •	Dr. Amani Al-Sharif (Dean of Faculty of Pharmacy Cairo Girls - Al-Azhar University and National Coordinator of the Union of African Universities). This session was more than wonderful because it contains lectures from various fields and the simplicity of the method of lecturers. 1 - Strategies for the future of medicine 2030. (Mohi Hafez). (Founder, Chairman and CEO of Pioneer Pharmaceutical Industries). (Professor of Nanoscience and Neonatal Medical Sciences Zewail City of Science and Technology). 3. Al-Azhar Technological Innovation Office "TICO" (Dr. Barakat Hassanein). (Director of Al-Azhar Technical Innovation Office) ("TICO Dean of the Faculty of Engineering at Al-Azhar University-Qena). The Nanotechnology Lecture had a strong impact on the students' ears, prompting them to research and discover more about the fields of nanotechnology and its applications, and to request the introduction of nanotechnology courses within the university and follow-up all new in this science. Not only that, but our students have been discussing all the students from other universities by exchanging information about their projects and other projects. At the end of the day, students were in a state of complacency and happiness in the new experience that added a lot to them.